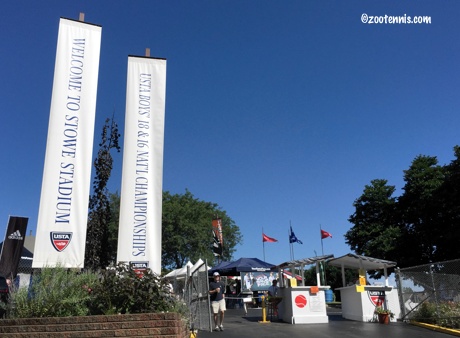 The selections for next month's USTA Boys 18 and 16 Nationals in Kalamazoo have been made, with 2015 finalist Stefan Kozlov among the 184 (eight wild cards are yet to be awarded) direct entries. The alphabetical list of both age divisions' acceptances can be found here. Kozlov, who lost to Donald Young 6-0, 6-4 in the second round of the ATP event in Newport, Rhode Island today, didn't seem likely to play Kalamazoo when asked about the possibility in this interview last week in Winnetka, and he may still withdraw, but it may be his best option for obtaining a US Open main draw wild card. I'm not sure why Michael Mmoh didn't enter, but he may apply for a wild card, with those decided sometime next week. It would not be unheard of for a defending champion to return, as both Donald Young and Jack Sock did, and Frances Tiafoe is still age eligible, but he is also 157 in the ATP rankings, much higher than either Young and Sock were when they returned. Other notable entrants are Ulises Blanch, who did not play Kalamazoo last year, Brandon Holt, who is recovering from a back injury that kept him from playing the grass season in Great Britain, William Blumberg, John McNally, JJ Wolf, Sam Riffice, Vasil Kirkov, Oliver Crawford, Gianni Ross, Alafia Ayeni, Keegan Smith and Nathan Ponwith. The Citi Open, a joint WTA/ATP event in Washington DC that this year is earlier in the summer than in years past, has announced several more wild cards for next week's tournament. Last week Canadian Denis Shapovalov, now the Wimbledon boys champion, revealed he had received a main draw wild card for his ATP debut. Frances Tiafoe and Reilly Opelka had previously received main draw wild cards. Today, the tournament announced that Usue Arconada, who won the Wimbledon girls doubles title on Sunday, would receive a main draw wild card into the women's event, making her WTA debut. Tennis Atlantic, a website providing onsite coverage of the ATP Hall of Fame tournament this week, provides additional news about wild cards for the Citi Open. Samantha Crawford has received a main draw wild card (it's not currently showing on the tournament's player list), while NCAA champion Mackenzie McDonald has been given a qualifying wild card. Ulises Blanch was previously announced as a recipient of a qualifying wild card. Varvara Flink, a 19-year-old Russian who is returning from injury this year, has received a qualifying wild card, as has Raveena Kingsley. Other wild cards are still to be announced. Next week's Binghamton New York Challenger, which kicks off the men's USTA US Open Wild Card Challenge, announced three of its four wild cards today, with Jared Hiltzik, Thai Kwiatkowski and Michael Mmoh receiving entry into the main draw. The full list of direct entries is available here. CiCi Bellis, who is playing this week at the $50,000 Stockton Challenger, has been given a main draw wild card into next week's Bank of the West Classic at Stanford.